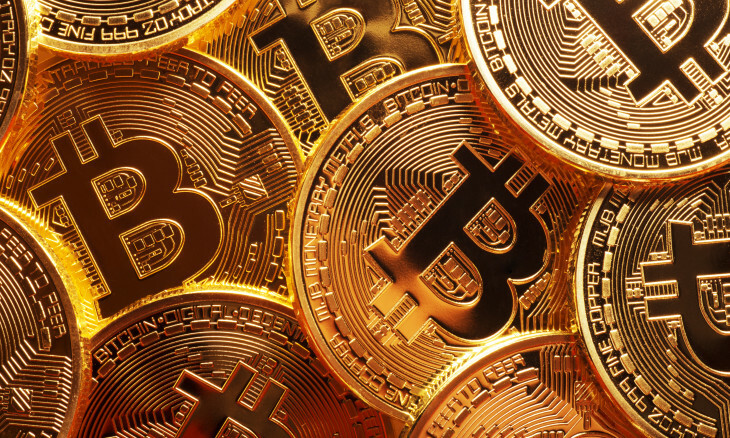 As the dust settles after the November 15 bitcoin upgrade, the roadmaps have been updated with the new state of the protocol and people are starting to looking ahead to the next set of features. I thought I’d take the opportunity to give my view on it. The new set of features ahead has been published on bitcoincash.org, which is for the most part spearheaded by the Bitcoin ABC implementation, but where Bitcoin Unlimited also deserves significant credit for research and development. In this post, I’m talking about the “bitcoin roadmap”. As there’s more than one bitcoin, I should clarify that I’m referring to Bitcoin-BCH, or the “Cash” version of Bitcoin, as opposed to Bitcoin-BTC, the “Blockstream” fork of bitcoin. For those familiar with the subject, this would be obvious, as the Bitcoin-BTC version doesn’t have a roadmap to scale, such as I’m describing here. 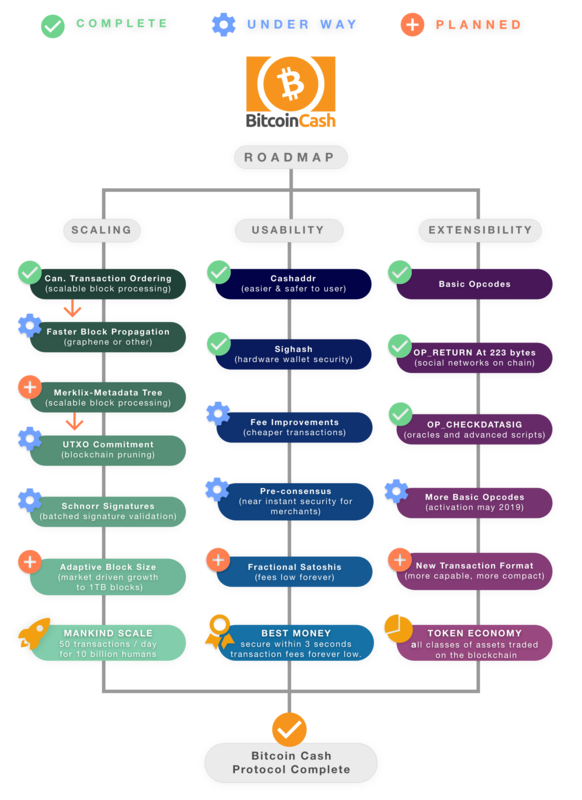 The Bitcoin Cash roadmap as of end-2018, as published at bitcoincash.org. I like this roadmap for two reasons. Or rather, for two levels of reasons. The first is that I see bitcoin as the path to a world currency. In order to be so, it will need to carry an insanely heavier load, and because of the typical velocity of money, each bitcoin must be valued far higher than it is today — to a point where single satoshis are no longer a small unit, but represent maybe a few cents. That quanta (smallest possible discrete value) is not small enough to provide frictionless automated microtrade, which is why I’m looking forward to — and have been discreetly applauding — the fractional satoshis on the roadmap. The bigger footprint a network gets, the more inertia it takes to change something, so getting these two items in with reasonable speed is something I regard as key. The third key item is extensibility — the ability to extend the protocol without asking permission, akin to how early browsers started supporting random new HTML markup tags left and right. This drove the standards forward and allowed for rapid feedback cycles with the user community, and something similar will be needed for permissionless innovation on top of bitcoin to really take off. These three taken together happen to represent the final phase of the three tracks that the roadmap lists. I have some understanding that each of them have necessary prerequisites that are being filled in some sort of logical order. This brings me to the Law of Two Feet. You see, it doesn’t really matter what I think of a feature, whether I like it or not. I am a diehard proponent of the Law of Two Feet: It simply means that if you don’t like something, then it is your responsibility — both toward yourself and the community you don’t like — to walk to a place you do like. This is what I worded as the Freedom of Initiative and the Freedom to Follow, and it is absolutely key for permissionless innovation. You don’t get that the moment somebody is trying to give somebody else permission on what road they may choose. Each of us have the freedom to take any initiative we want. Each of us also have the freedom to follow any initiative we like. But no one of us may tell another what they must or may not do. I happen to very much approve of the above roadmap from where I’m sitting. But even if I didn’t, the freedom of initiative and freedom to follow are far more important than my opinion on this particular initiative. Thanks for the article. So, do you think Bitcoin Cash has more of a future than the original Bitcoin now? I’m looking at investing in crypto again soon, but with so many options out there, it’s hard to know where to invest these days. Do you have any word of wisdom regarding this?